NCCN guidelines recommend genetic testing for all triple-negative breast cancer (TNBC) patients aged ≤60 years. However, due to the lack of prospective information in unselected patients, these guidelines are not uniformly adopted by clinicians and insurance carriers. 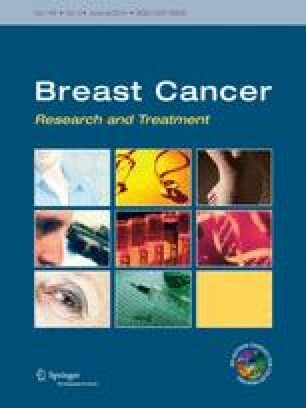 The aim of this study was to determine the prevalence of BRCA mutations and evaluate the utility of NCCN guidelines in unselected TNBC population. Stage I–IV TNBC patients were enrolled on a prospective registry at academic and community practices. All patients underwent BRCA1/2 testing. Significant family history (SFH) was defined >1 relative with breast cancer at age ≤50 or ≥1 relative with ovarian cancer. Mutation prevalence in the entire cohort and subgroups was calculated. 207 TNBC patients were enrolled between 2011 and 2013. Racial/ethnic distribution: Caucasian (80 %), African–American (14 %), Ashkenazi (1 %). Deleterious BRCA1/2 mutations were identified in 15.4 % (32/207) of patients (BRCA1:11.1 %, BRCA2:4.3 %). SFH reported by 36 % of patients. Mutation prevalence in patients with and without SFH was 31.6 and 6.1 %, respectively. When assessed by age at TNBC diagnosis, the mutation prevalences were 27.6 % (≤50 years), 11.4 % (51–60 years), and 4.9 % (≥61 years). Using SFH or age ≤50 as criteria, 25 and 34 % of mutations, respectively, were missed. Mutation prevalence in patients meeting NCCN guidelines was 18.3 % (32/175) and 0 % (0/32) in patients who did not meet guidelines (p = .0059). In this unselected academic and community population with negligible Ashkenazi representation, we observed an overall BRCA mutation prevalence rate of 15.4 %. BRCA testing based on NCCN guidelines identified all carriers supporting its routine application in clinical practice for TNBC. The online version of this article (doi: 10.1007/s10549-014-2980-0) contains supplementary material, which is available to authorized users. This work was supported by The University of Kansas Department of Internal Medicine Research Career Award, KU Cancer Center’s CCSG [P30 CA168524] Biospecimen Repository; and Myriad Genetic Laboratories, Inc.
Priyanka Sharma currently conducts research sponsored by Myriad Genetic Laboratories, Inc. Jennifer Klemp and Larry Geier are members of the speakers’ bureau and receive honoraria from Myriad Genetic Laboratories, Inc. All remaining authors have declared no conflicts of interest. All patients signed a written informed consent on a registry protocol approved by the University of Kansas Medical Center Human Subjects Committee, the designated Institutional Review Board, as required by 45 CFR 46 and 21 CFR 56.